‘Yai’ is the instrumental track from last year from Cosmic Gate’s ‘Start To Feel’ album. Now it returns as a vocal and their first single of 2015. Bringing a fresh angle to the track is JES, the songstress behind Motorcycle’s legendary ‘As The Rush Comes’, previous Cosmic Gate track ‘Flying Blind’ and many more. Jes user her vocals and lyrics to further develop ‘Yai' with an emotive tale of a relationship on the ropes. 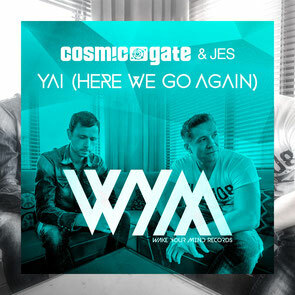 Now retitled ‘Yai (Here We Go Again)’, her vocal is a reflection of Cosmic Gate’s production, where brooding, dark-tech riffs, edgily play off against more optimistic synths. Premiered by Armin van Buuren as his Tune of the Week on A State Of Trance 698, and one of a host of exclusive tracks to be featuring on a new, soon to be announced Cosmic Gate music compilation project, have a listen to it below. I think the admin of this web page is in fact working hard for his site, since here every data is quality based stuff.